Jumpstart’s vision is that “every child in America enters kindergarten prepared to succeed.” In service of this vision, Jumpstart has been working to achieve several goals, including 1) creating enriched learning environments where children from underserved communities are supported in the development of language, literacy and social-emotional skills, and 2) supporting the development of an early learning workforce. 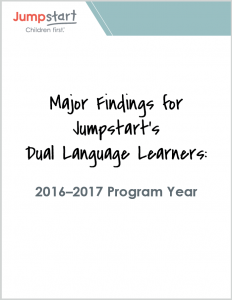 Each year, the Research and Evaluation department evaluates Jumpstart’s progress toward these goals by analyzing both child participant and adult volunteer (i.e., member) outcomes. While a variety of implementation models exist, the essential element of Jumpstart’s program remains constant—a caring, dedicated adult (i.e., college student or older adult) who forms nurturing relationships that encourage children to thrive. These adults, called members, are trained to use effective strategies and a research-based curriculum that engages preschool-age children in purposeful interactions and group activities aimed at building the children’s language, literacy, and social-emotional skills. Jumpstart members reduce the in-classroom child-to-adult ratio, allowing children to benefit from a more intensive and individualized learning experience. 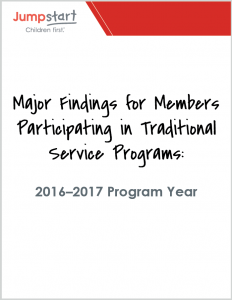 Of the 3,918 members providing service during the 2016-2017 program year, 176 were older adults serving as community members. For the 2016-2017 program year, Research and Evaluation presents its findings as a collection of mini-reports. 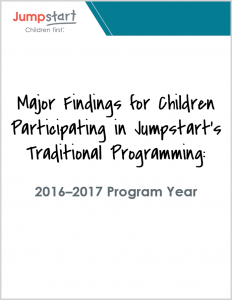 This new format allows for more in-depth analyses of the outcomes of children participating in different types of programming, and children representing demographic subgroups that are of particular interest to Jumpstart. 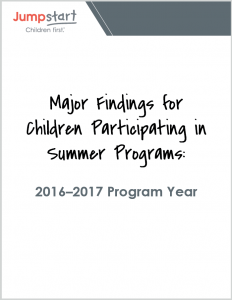 For example, one report describes the outcomes for children who are Dual Language Learners, and another describes the outcomes for children participating in summer programs. A list of available mini-reports is below. [i] 216 children were in the Arizona Workforce Development program, 854 were in the Curriculum Revisions pilot, 45 received enhanced classroom assistance time (Enhanced CAT), 26 were at Jumpstart Hartsville (franchise), 26 were in the New York Extended Day program, and 251 were in the San Francisco State University Jumpstart EDVance workforce pilot. [ii] 39 children were served through the Massachusetts Service Alliance’s summer program; 47 through National Direct’s Boston summer program, 39 through National Direct’s Chicago summer program, 79 through National Direct’s Pittsburgh summer program, 445 through the New York summer program, and 48 through the Atlanta Bridge summer program.